Reputas, LLC strives to educate your child in every aspect so that he/she will be raised smart, independent, and multilingual. We make children’s education apps for learning languages, learning to read, logical thinking, and Multilanguage story books and more. Our apps are fun, animated and attractive for children. 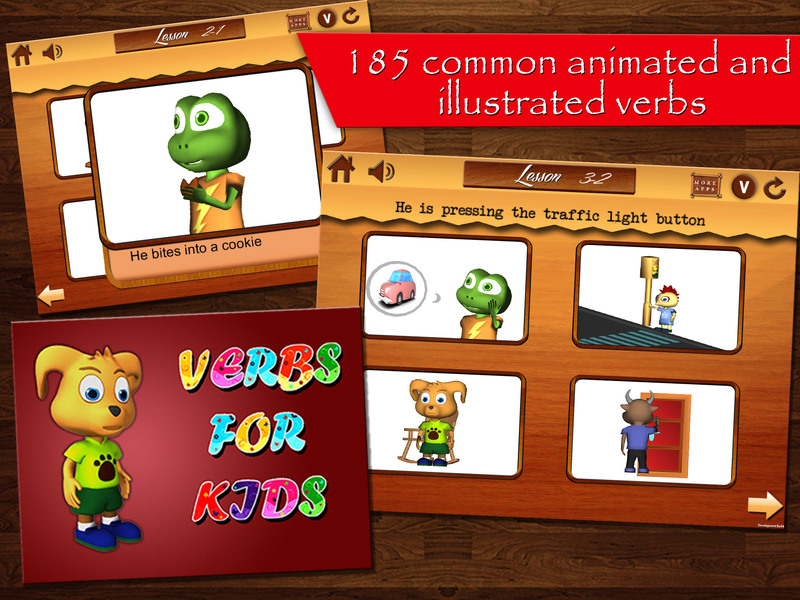 ‘Verbs for kids’-1 has 183, and Part 2 has 185 animated and illustrated verbs, in high quality 3D cartoon format. The application contains the most important verbs (100 animated and 83 illustrated) with corresponding audio and sound effects. The aim is to learn the verbs at word and sentence level with the flexibility to select which verbs are to be practiced. The secondary purpose is to develop vocabulary skills, speak by using subject-verb agreement, and learn the language. There are three modes in the app: ‘Flashcards’, ‘Find it’ and ‘Test’. The application is fun and many cute animations. Nineteen different cartoon characters will definitely attract your child’s interest. Sentences are spoken with each flashcard. After four flashcards, a sentence is read to motivate your child to select the correct flashcard. Flexibility to go into ‘verb’ modes at any time by interrupting the lesson. Corresponding verb is read and appears as written. 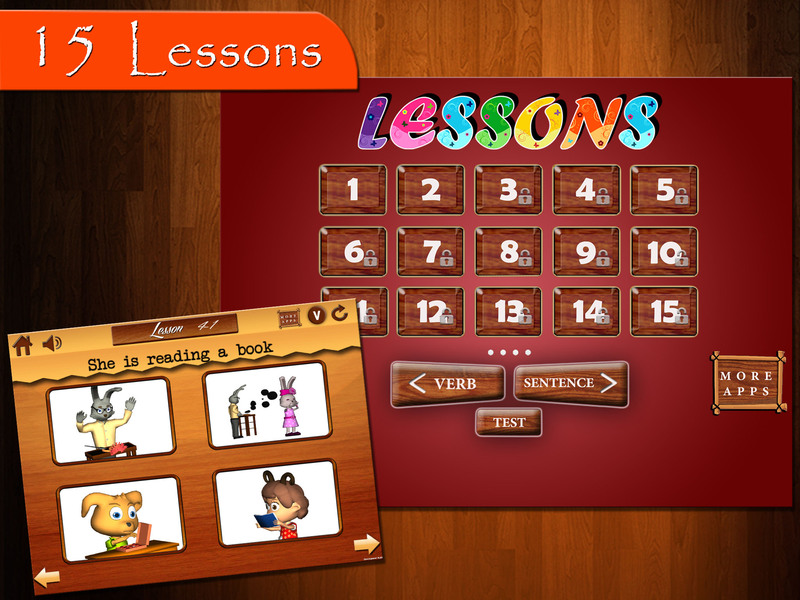 The application has 15 lessons and fun sections to have a break. Test modus tests your child’s learning to a corresponding lesson. Corresponding sound effects such as crying, driving, and water running reinforce the verbs. Ten different languages (English, German, French, Spanish, Portuguese, Russian, Chinese, Japanese, Italian and Arabic) give your child a great opportunity to learn different verb languages. Enjoy our animated language learning app for your children and kids, and learn many languages. Once your child masters the most important verbs from the first part, you can move on to the second part. 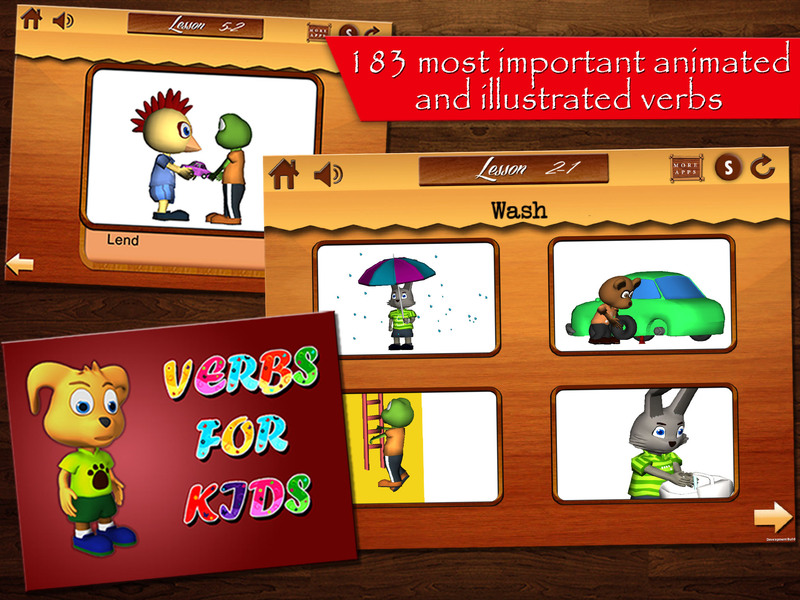 It features 185 common verbs (80 animated and 105 illustrated) with corresponding audio and sound effects.